Tolkien is a biopic based on the early life of J.R.R. Tolkien, author of the Lord of the Rings novels. 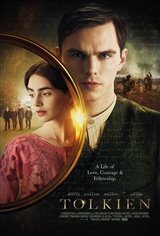 Tolkien (Nicholas Hoult), a language-loving orphan living in England, finds friendship and inspiration in a group of fellow students who start referring to themselves as a "fellowship." He also meets and falls in love with Edith Bratt (Lily Collins), his future wife. But when England enters World War I and Tolkien's relationships are threatened by danger and distance, he's inspired more than ever to pen what will become his epic fantasy novels.